Gloria Chuku, chair and professor of Africana studies, and affiliate professor of both gender and women’s studies and language, literacy, and culture, has received the 2017 Ali Mazrui Award for Scholarship and Research Excellence from the board of the Toyin Falola Annual Conference on African Diaspora (TOFAC). The award honors the legacy of Kenyan-born professor Ali Mazrui, known for his research on African history and critical analysis of western influence in Africa. It acknowledges scholars whose academic work is substantial, rigorous, and original, and has a far-reaching impact on one or more disciplines within African(a) studies. 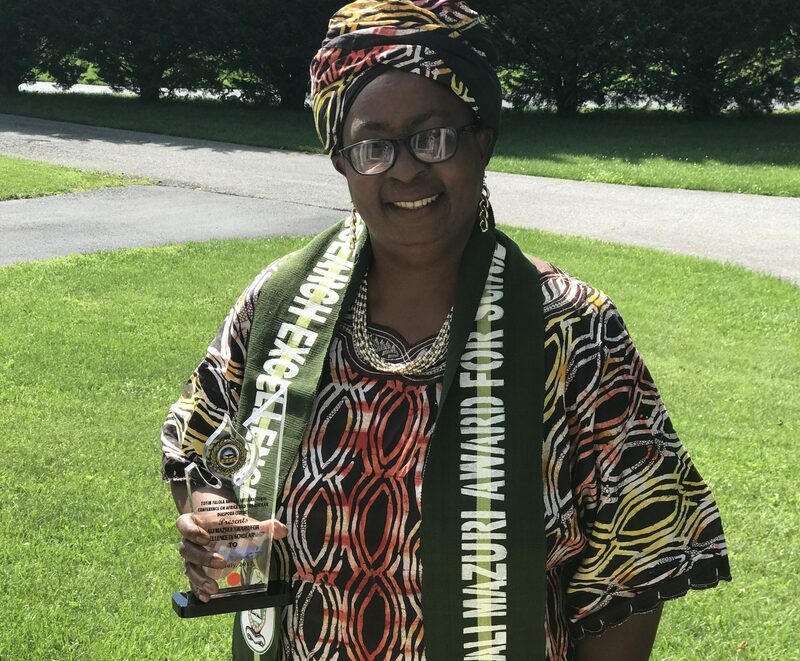 Chuku was honored as the first woman to receive the award at a special event during this year’s TOFAC gathering, held in July at the Adeyemi College of Education, in Ondo, Nigeria. Previous recipients include Nimi Wariboko, professor of social ethics at Boston University School of Theology, and Sabelo Ndlovu-Gatsheni, founder of the Africa Decolonial Research Network at the University of South Africa. Chuku’s 2017 Ali Mazrui Award. Photo courtesy of Chuku. Chuku’s research spans continents and explores, in-depth, complex issues related to gender, cultural, ethnic, and religious differences and their intersections. Her first book, Igbo Women and Economic Transformation in Southeastern Nigeria 1900-1960 (Routledge, 2005), remains the most comprehensive study on Igbo women, covering all Igbo subculture zones. In addition to honoring influential scholarship, the award also celebrates transformative leadership in higher education, and serves as a recognition of Chuku’s commitment to mentorship and student success. Chuku also presented a paper during the TOFAC conference. Using data from Belgian, English, French, German, and Portuguese colonial and mission education policies, she discussed formal education and women’s agency in colonial Africa. In addition to presenting, Chuku chaired a panel on indigenous education and knowledge systems in Africa, exploring values, crafts, trade, skills, and knowledge acquisition before Islam, Christianity, and Western education were introduced. Connecting all of these projects is Chuku’s underlying passion for helping scholars, students, and broader communities better understand the past, present, and future of Africa. Toyin Falola, the namesake of the TOFAC conference, will present UMBC’s annual W.E.B. Du Bois Distinguished Lecture (part of the Social Sciences Forum series) this fall. Falola is professor of history and Jacob and Frances Sanger Mossiker Chair in the Humanities at the University of Texas, Austin. The lecture will discuss contemporary African immigrant communities in the U.S. It will be held on November 8, 7 – 8 p.m., in the UC Ballroom. Banner image: Gloria Chuku, chair of Africana studies. Photo by Marlayna Demond ’11 for UMBC.